After careful consideration, we came to the conclusion that we need to establish new manufacturing system and to develop new product platform, in order to achieve low prices the customers demand. Until now, all TEIN dampers can be disassembled for overhaul; however, we introduce new "Sealed Structure" to FLEX Z. Please see below for a part of production process of FLEX Z at TEIN HQ Factory in Yokohama, Japan. FLEX Z kit includes upper mounts exclusively designed for each vehicle model; either reinforced rubber mounts or pillow ball mounts. Pillow ball upper mounts for front strut suspensions have camber adjustment feature. FLEX Z kit includes pillow ball upper mount camber plates for the front for easy adjustability. Surface is powder coated for superb protection against chipping & peeling, for high durability and for superior anti-corrosion performance. High-quality spring can be used under various conditions without any worry. The most suitable shape of spring (straight or barrel-shaped) is determined for each vehicle model, to provide wide ride height adjustable range and to secure sufficient stroke without compromising ride comfort. NO need to return the original shock absorber. As shown above, Replacement Service allows the customer to purchase and replace the shock absorber body, excluding outer parts (upper mount, lower bracket, spring etc.). 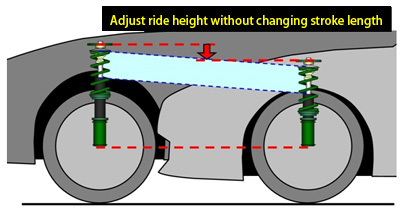 For Overhaul/Revalving service, because the shock absorber has to be detached from the vehicle, sent back to TEIN and then returned to the owner once the job is done, there are some disadvantages; Need to prepare loaner (substitute) shock absorber while waiting for overhaul job, Require to do removal/installation twice, and/or can not use the vehicle left on the lift while waiting for overhaul job. Replacement Service is time-efficient as the customer can purchase a replacement shock absorber in advance and replace with the old one whenever ready.